IAN HAMPTON - Bass player on Sparks ''Propaganda'' and ''Indiscreet'' albums. Ian Hampton was born on January 4th, 1947 in Edinburgh, Scotland. Soon he played in various outfits and became a star in his home town. Ian's early influences were mostly The Beatles, The Kinks & The Beach Boys but he liked Beethoven's music too. Except bass guitar he played guitar & some keyboards but was self taught. Ian Hampton's other interests were Motor car racing, in which he had won several local awards. Ian Hampton knew singer Ian "Ralf" Kimmet since age of 5. They attented the Royal High School together in Edinburgh and both played in local bands in Scotland. When Kimmet and guitarist Trevor White, spent some months in Kimmet's native Jedburgh, they met Ian Hampton and with the addition of drummer Chris Townson they put Jook together. The band was managed by John Hewlett (ex-John's Children). 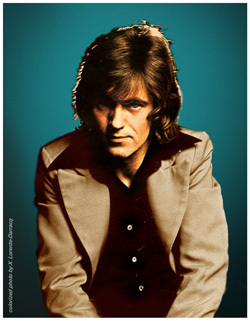 John Hewlett secured a record deal with RCA and a publishing contract with producer Mickie Most. Meanwhile, together with manager John Hewlett, Ron and Russell Mael were looking everywhere in England for potential recruits. The Maels liked Jook and an idea of merging the two bands was proposed. Jooks own future at that point looked promising and even Sparks were a great group when it came to it the boys felt so bad about breaking up the little family theyd been in for a couple of years. 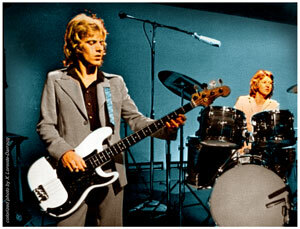 During the "Kimono My House" era, the Maels wanted previous bassist Martin Gordon to use a Fender Precision bass instead of his Rickenbacker 4001 bass for live appearances of the band but the bass player didn't. So they appreciated a lot Ian Hampton playing Fender bass guitars. Ian got a white Fender Precision and a superb gloss black finish Jazz bass and claimed it was a delight to play it. 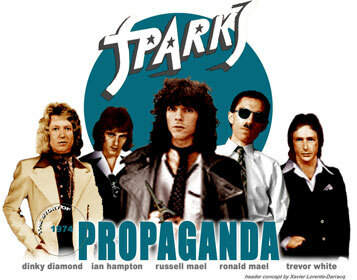 Ian Hampton played live alongside with Ron & Russ Mael and recorded Sparks' "Propaganda" (1974) and "Indiscreet" (1975) albums. He loved working with the Maels. During Sparks recording sessions he liked Ron Maels attitude which was very positive and open to all input from others. Ian Hampton : "After the wonderful Sparks concert at the Olympia Theater in Paris, in 1974, the band retired back to the Hotel George V, which at the time, was the most opulent hotel in France. If not in the world. However, the bar prices were absurd, so we Brits would seek out cheap places to sup the occasional ale after dark. On this particular evening, guitarist Adrian Fisher and I found our Nirvana - Beer - Cheap ! After Ron & Russell Mael decided to disband Sparks after the tour of USA in 1975, Trevor White, Ian Hampton and Dinky Diamond rehearsed for a week at Island Studios in St. Peters Square London with guitarist Adrian Fisher. Four songs were recorded quickly at the end of the week and probably engineered by "Digger", Richard Digby Smith. "I See the Light" had Trevor, Ian and Dinky sharing lead vocals, "Adrian's Boogie" was a result of what Adrian loved to do and "If it's Love That You Want " and "Shot From A Gun" were two of Trevor's songs featuring himself on vocals. The tape was presented to Island Records at the time but they decided not to pursue any further development of the project. Then Ian Hampton did studio sessions mostly. He backed Elizabeth Barraclough in 1978 for two albums released on Todd Rundgren's Bearsville label and Ian Hampton also played with various artists as The Three Degrees, Hazel O'Connor and Hot Chocolate. Then Ian Hampton gradually left the music business and nowadays he runs a lovely Bed and Breakfast in a former coaching inn dating from the 17th century in Wales. Still involved in musical instrumments Ian Hampton currently owns a cream Fender Jazz Bass, a Black Rickenbacker 4001, a Fender Stratocaster and a Gibson accoustic guitar. He's still closer with the Maels and is in touch with all Sparks musicians, past and present.